snowdeal.org > ex machina: the eric update - day 1062: odin's garden sittin' stone. 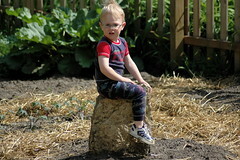 the eric update - day 1062: odin's garden sittin' stone. it was late morning and although odin was still in his dinosaur pajamas he asked politely to go outside after looking out the kitchen window towards the garden. a few minutes later i looked out the window and saw him sitting on the stone in the center of garden in a variant of the classic thinker pose, legs crossed with his elbow on his knee and hand propped under his chin, gazing off into the distance. unfortunately, although predictably, i startled him when i clumsily opened the back door with the camera.